Lending as a practice probably goes back as far as the caveman. For the sake of avoiding boredom, I’ll fast-forward to how lending to individuals has evolved in the U.S. As with anything, change is brought about by a need or some form of disruption. Consumer lending has seen disruption in the U.S. over the past 250 years. When we look at the timeline below, the traditional banking system was established in the early 1780s with the state-chartered Bank of Pennsylvania. It was soon followed by the first national bank … Bank of North America … in 1781. However, one of the earliest and most bizarre forms of consumer credit or mortgage was indentured servitude. The concept of indentured servitude was born of a need for cheap labor. The earliest settlers realized they had lots of land to care for, but no way to maintain it. In the decade following the settlement of Jamestown, The Virginia Company was established and brought new settlers from England. Since passage to the new colony was expensive for all but the wealthy, The Virginia Company developed the system of indentured servitude to attract workers in exchange for housing and eventually small plots of land. Another example of this practice is the coal mining companies in early Appalachia. In the late 1800s, post-civil war, wealthy industrialists began scouting the mountains for resources to fuel industries like steel, railroads, and electric power. By 1920, 70% of Appalachia’s mineral rights were owned by corporate interests, which also owned 40% of the privately held land.1 To meet the desperate need for laborers, the coal companies built coal camps to house workers recruited from immigrants, who found it difficult to get work in the cities, and newly freed slaves, who had left Southern sharecropping plantations. Workers were required to open a line of credit at the company store to buy their first rations of food, clothing, and the equipment they needed to mine coal. Most of these companies paid their laborers only in company “scrip,” a form of currency usable only at company-owned establishments and for company-provided services. The use of scrip finally faded away by the mid-1960s as the influence of unions, in this case the United Mine Workers of America (UMWA), became more prominent. There were still some instances of indentured servitude in Mexico as late as 2008 when the Mexican Supreme Court outlawed the use of payment vouchers being used by Walmart to pay their workers. These vouchers could only be used at Walmart stores. In 1878, the first finance company, Household Finance Company, emerged providing small dollar personal loans to consumers. This also introduced the concept of installment lending. 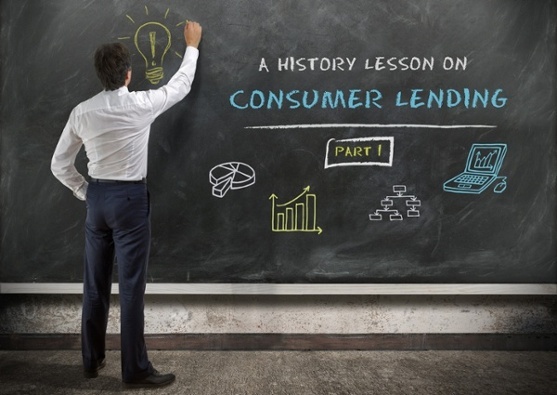 To be continued … the second part will describe the evolution of lending from the 1900s to today.